Kuhli Loach is a popular small bottom-dwelling aquarium fish which looks like an eel with its thin elongated body. It belongs to the large and diverse group of loaches family that includes the clown loach, pygmy chain loach and also the orange-finned loach. Kuhli just like some of its eel-like cousin loves to dig deep into the aquarium gravel substrate and hid itself away from your attention. There are basically two different types of kuhli loaches which you can find sold in aquarium stores. The most common is the black and grayish type while there is also the striped kuhli loach. Both of them are community species which will tolerate and live peacefully among each other and also together with the other tropical aquarium fish. They will not cause any problems with the other tank mates when it comes to competition of foods and living spaces but in fact, because of their friendly nature, they will often become target of bullying by the other bigger fish. Adult mature kuhli loach will only grow up to 3 inches in length and those younger smaller ones were often mistaken as food by the larger fish like discus and gourami will often make a meal out of them. Because of this, the fish are best kept in a group of 5 or more and because they exist in large number, this will lessen the chances for them to become subject of bullying by the other fish. 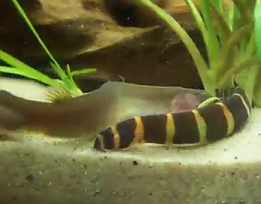 Kuhli loach will take any food given to them and they love constant feed of live foods such as tubifex and bloodworms. If those are not available, you can also consider using sinking dried fish flakes as well and your pets will readily accept them. One word of caution however, if you have a community of freshwater shrimps or snails, you might want to avoid having your kuhli loaches in there, because they will eat the crustaceans as foods. Usually the fish is a very active playful lot and during their normal behavior you will find them wriggling around sometimes among each other while at times, you will see them going against the aquarium glass surface. If for any reason, you don’t find that happening and your fish seems to stay idle all the time that is a sign that your pet might be sick. Setting up the aquarium to house your kuhli loach should be easy because as long as you have a planted tank with lots of decoration for hiding and fine sand or gravel substrate, that should be perfect. Before you actually buy and put in your pets, make sure that the water is fully cycled because kuhli loaches are not tolerant to the poor water condition. I would suggest using corydoras catfish to fully cycle and getting the tank and water ready before you add them in. Avoid the temptation to quickly add them in a rush before things are fully ready because if you do that, not only you will risk losing your new pets but the ones that survive might not be healthy at all.